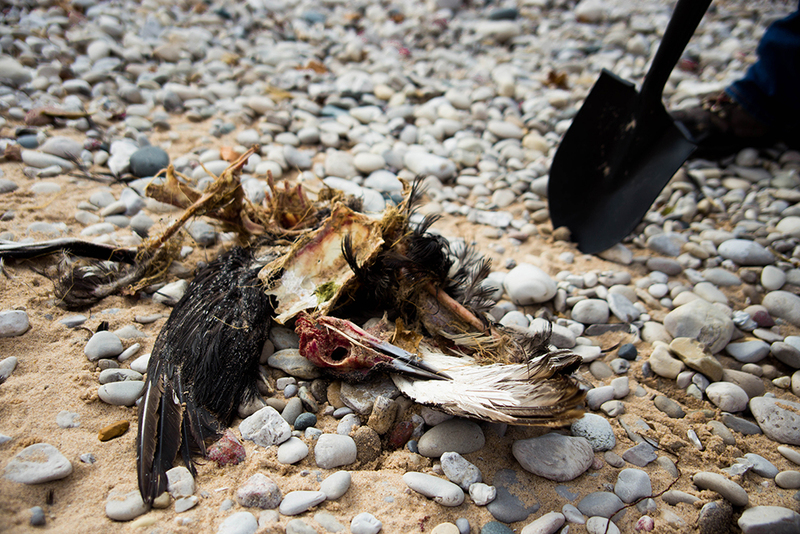 Since 2006, dead birds have been washing up on Lake Michigan beaches. But this fall has been exceptionally grim, with up to five thousand birds being found dead along the shore. Researchers are trying to understand what’s happening. 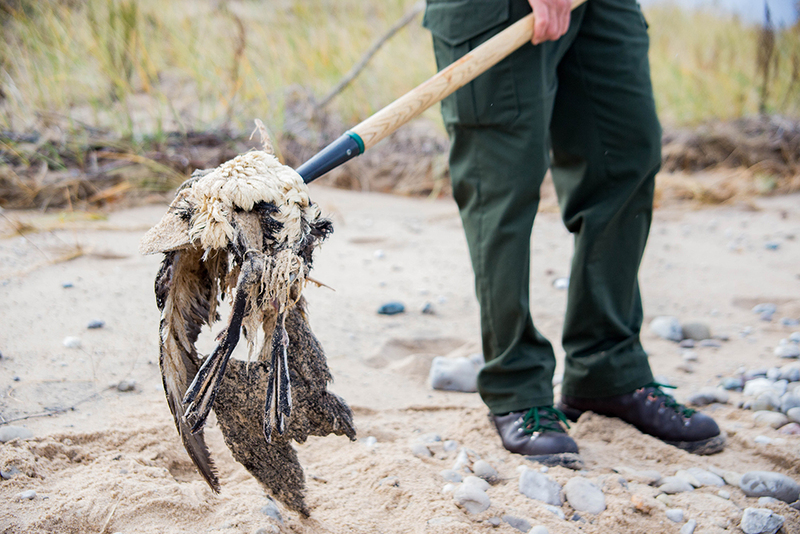 Two researchers are monitoring the coast where dead birds have been washing up: Dan Ray of the National Park Service and Jeanie Williams of the Inland Seas Education Association. 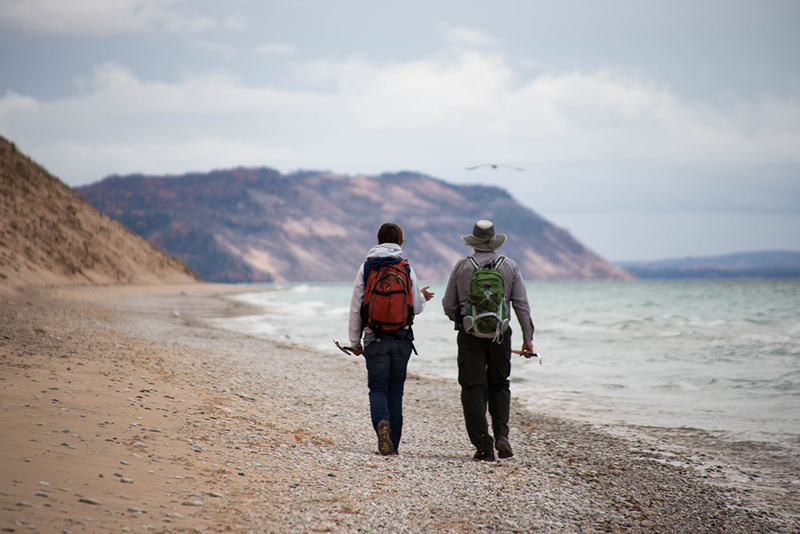 They’re walking along a beach in Sleeping Bear Dunes National Lakeshore. The typically pristine coast is littered with about two dozen dead birds including scoters, loons, ducks, and more. Researchers say the birds are dying because of a toxin called avian botulism, which can form on the lake bed under certain conditions. Standing over a dead duck, Ray describes what he sees, and the procedure that follows. Botulism forms when there’s a lack of oxygen in the water. For that to happen, it takes a long chain reaction that begins with invasive Zebra and Quagga mussels filtering the water, which increases its clarity. Williams of Inland Seas explains. The native algae thrives on those nutrients and the additional sunlight, growing prolifically over the summer months. However, living algae poses no issue, and it’s not until it dies that it becomes a problem. Harvey Bootsma is a professor at the University of Wisconsin Milwaukee. He says the northern part of Lake Michigan is the perfect place for botulism to thrive. When the dead algae collects in these pockets and decomposes, it uses up the nearby oxygen, creating the ideal conditions for botulism. Even as botulism begins to form, it’s down near these toxic valleys that many small fish continue to eat, consuming the poison as they feed. Local and migratory birds that land on Lake Michigan, tired and famished from their journey, consume small fish like the invasive Round Goby. Having eaten the infected fish, the birds become sick and die out on the lake due to paralyzing effects. Local waterfowl populations could be threatened by the presence of botulism, especially since some of them are already endangered. 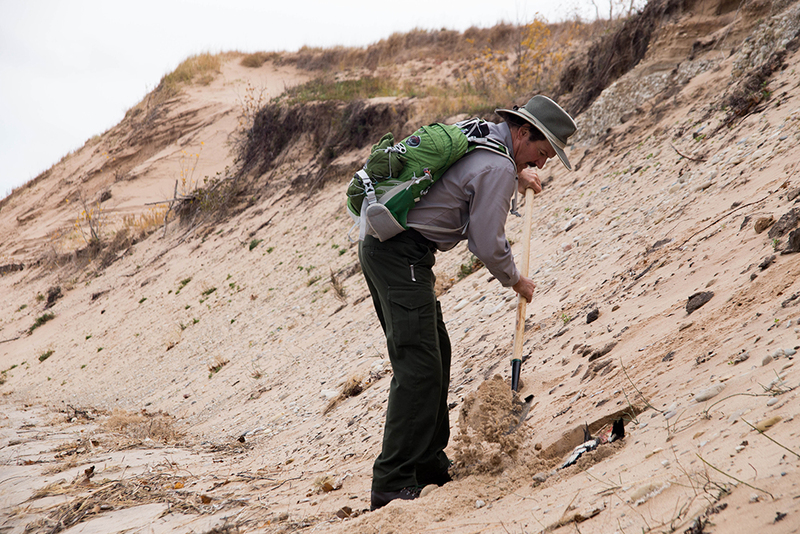 Bootsma says that both the Piping Plover and Common Loon populations in the Sleeping Bear Dunes area have been significantly affected. Despite the negative effects that botulism is having on wildlife, Ray emphasized that so long as it isn’t ingested, it poses no threat to humans. This story was produced as part of a partnership with Great Lakes Echo and Interlochen Public Radio where it first appeared. I know what also severely compounds these outbreaks but am reluctant to waste my time on people that don’t listen. When will environmental groups finally acknowledge that EPA never implemented the CWA! Because, when it established sewage treatement requirements, it used an essential test incorrect, using the 5-day, instead of its full 30- day value. By doing so EPA (and everybody else) not only ignored 60% of the pollution exerting an oxygen demand, but all the nitrogenous (urine and protein) waste. This waste is also a fertilizer for algae and now called nutrient waste, but mostly blamed on the runoffs from cities and farms. It really should not have to take more than 33 years to correct an essential test, so we finally also will know how sewage is treated and prevent multi-million dollare sewage treatment plants being designed to treat the wrong waste.